Portugal is the 30th country to join the ProtonVPN network! Posted on November 29th, 2018 by ProtonVPN Admin in Service Updates. To keep up with the number of new users we had to double the size of our network over the past five months. In that time we have added over 80 new servers in 15 new countries. 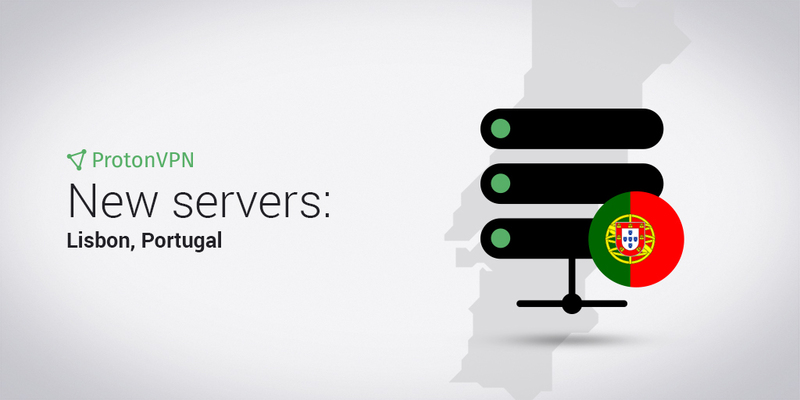 We installed four new servers in Portugal this week as we continue to grow in response to demand from users. We continue to work our way through our community poll in which Portugal placed 14th. We may be growing swiftly but we have never lost our focus on what is most important: providing you with a secure and private VPN service. These VPN servers will help any Portuguese abroad who are missing the music of their native land. By logging in to any of the new servers in Lisbon, users with a paid account can listen to the Portuguese version of Spotify. They will also be offered the Portuguese version of Spotify Premium which, at €6.99 a month, is cheaper than many other options. Members of ProtonVPN Plus or Visionary will have exclusive access to servers PT#2-4 as well as access to our Secure Streaming feature, which allows you to stream Hulu, HBO GO, Netflix, Channel4, Channel5 and other video sites without compromising your online security. ProtonVPN is a free VPN service developed by the same team that created ProtonMail, the world’s largest encrypted email provider. We are the only secure, community-supported VPN service. To start protecting your online activity today, click the sign up button below. Or if you already have an account and want to upgrade to access our VPN servers in Portugal, click upgrade. Our mission is to keep our users’ online activity secure and private. Thank you for your support. Keep an eye out for new developments on our social media pages below. I was quite astonished when i turned my PC, only to be startled at the sight of my homeland being presented within the list of available servers. I swiftly proceeded to perform some tests. Everything checks out and fortunately there are no conflicting database issues as of yet. However, the owner of the IP range is an Indian company called Hostroyale Portugal Range and the ISP is Austrian, called Amol Kotkar trading as A K Digital Media. Is this regular proceeding? I always see this type of network configurations on every proton server, but like i said, no conflicting issues whatsoever, as seen in other servers. I think i can speak on behalf of my fellow countrymen when stating that this is the best Christmas present ever, thank you ever so much ProtonVPN Admin.